The place where I’ve worked for the past 2 years and 8 months is no longer where I hang my work hat, as it were. I’ll have some good memories of the place, but ultimately this decision is for the best. Hopefully I will find something a lot more fulfilling, that will allow me to embrace my creative side and do more of the things that I would like to do. 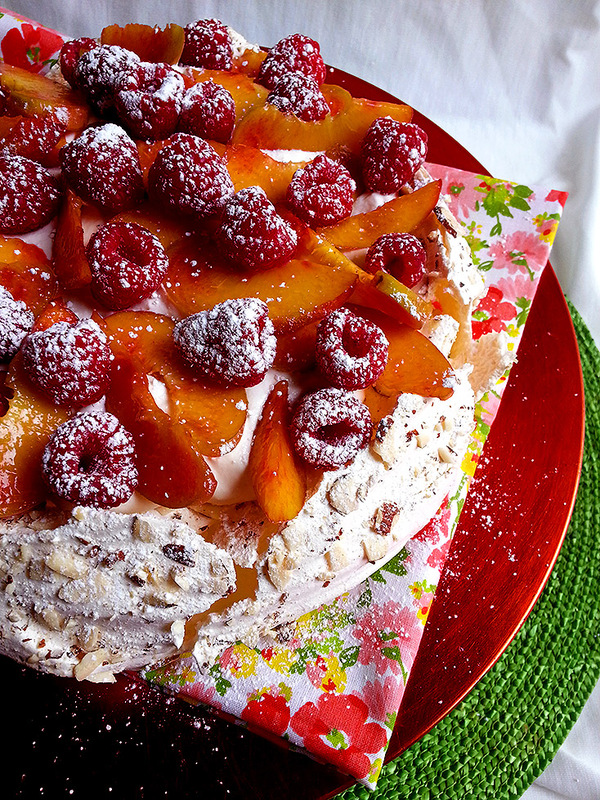 That said, this pavlova can be whipped up in a short afternoon if you find yourself suddenly having something to celebrate! This is the first time I’ve made a pavlova, and it could not have been easier. I was a little apprehensive about it in the beginning because for some silly reason, I imagined it to be overly complicated. In reality, it’s hardly anything more than a sweet meringue whipped up and baked in a low oven, and topped with mounds of whipped cream and some beautifully ripe fruit. I was super stoked to get my hands on the peaches that topped this dessert, they’re from Agritopia (an urban farm in Gilbert, AZ). These organic peaches were much sought-after at Agritopia, and I was lucky enough to get some from their booth at the Gilbert Farmers Market last weekend! Use the freshest, most ripe (and hopefully local!) fruit that you can find, cause this dessert really allows the fruit to shine on its own with little adornment needed. Grab a sheet pan and a piece of parchment paper, and trace a 7 inch circle in pencil on the parchment. Turn the pencil side over and put the paper on your sheet pan, and preheat your oven to 250 degrees. For the pavlova, beat the egg whites in the bowl of a stand mixer with the whip attachment on medium speed (5 on a KitchenAid) for 3-4 minutes, until soft peaks form. Stir together the sugar with the cornstarch. Turn the mixer to high and add 1 tablespoon of the superfine sugar/cornstarch mixture at a time to the egg whites until it’s all incorporated, continuing to beat for 4 minutes on high so that all the sugar mixture is added to the egg whites. By now, the meringue should feel smooth between your fingers with no gritty sugar, and should be very stiff and glossy. Briefly whisk in the almond extract, and then fold in the vinegar with a spatula. Scoop out the meringue into the parchment circle and smooth it out so that it keeps a round shape inside the circle. Smooth the top flat, then make a slight well in the top of the meringue. Sprinkle the whole meringue with the chopped almonds. Bake for 60-70 minutes at 250 degrees. When it’s done, the pavlova should be very pale golden colored, and firm to the touch. Turn off the oven and open the door a crack, letting the pavlova cool completely in the oven for 3-4 hours. If you don’t plan on serving it immediately, place the pavlova in an airtight container at room temperature for up to 3 days. When ready to serve: In the bowl of a stand mixer, whip the heavy cream with the sugar and vanilla extract until medium peaks form. Dollop all of the whipped cream in the center of the meringue (don’t worry if some cracks happen, or if chunks of the outside start to fall off! ), and arrange the peaches and raspberries (or whichever fruit you prefer!) on the whipped cream. Sprinkle with powdered sugar, slice into pie-shaped wedges with a large serrated knife, and devour! Any uneaten pavlova can be stored in an airtight container in the fridge for up to 2 days, though the texture will soften slightly. This post is part of the monthly link up party Our Growing Edge. This event aims to connect food bloggers and inspire us to try new things. This month is hosted by Eva from Kitchen Inspirations!